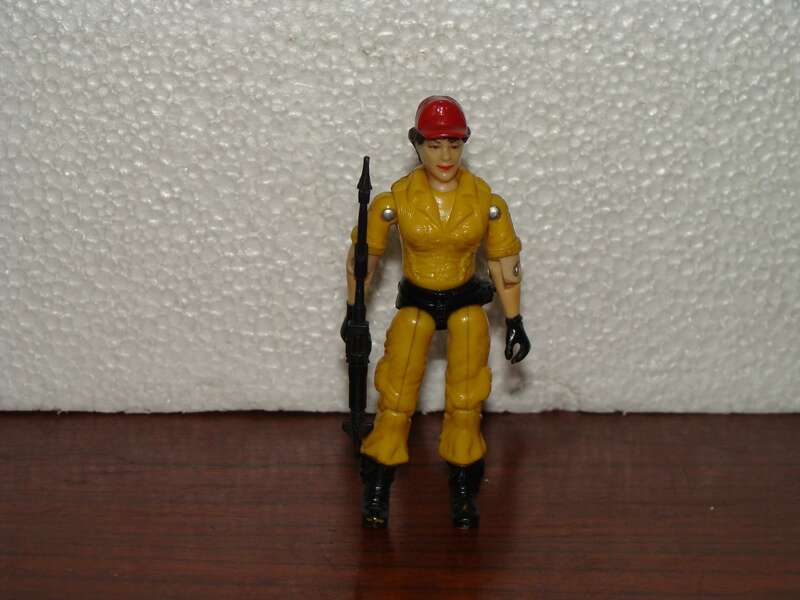 This figure truly is one of the holy grails in terms of international GI Joe collecting. This is the first and only known example of Canary Ann. Until a few weeks ago, there was only a picture of her file card. This figure was privately sold. I didn’t have the cash on had to buy this, as I have been on quite the buying spree. However, I will be saving up and setting aside some cash for future grail finds such as this. I waited a couple weeks to show to hoping that the buyer would post pictures somewhere. I believe that things like this should be shown, there is absolutely no reason to hide stuff. So, I’m revealing it to everyone because no one else will. Here is some background on this figure as well as the other figures it was released with.They were the free figures, that were given away on the purchase of ‘Complan Chocolate Health Drink’. Here are the first ever pictures (front and back) of Canary Ann, as well as the file card (front and back). Categories: Uncategorized | Tags: Cobra, Funskool, G.I. 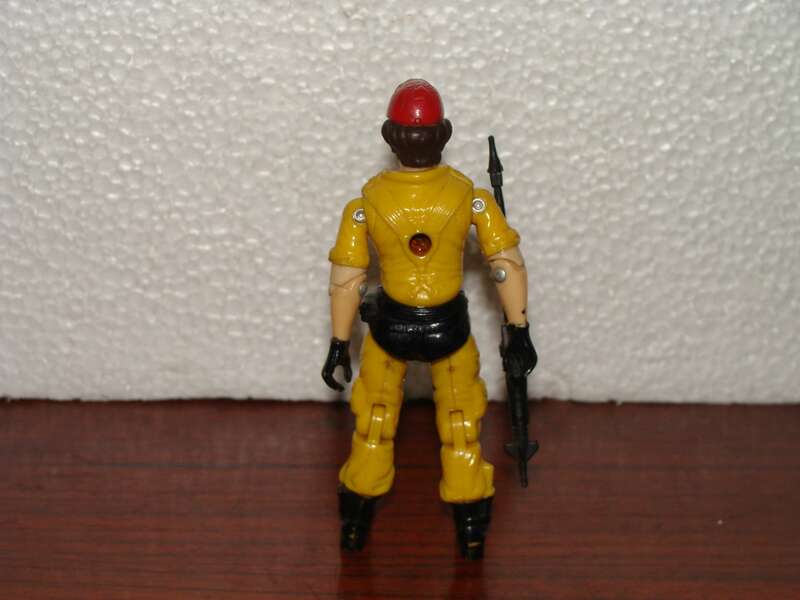 Joe, GI Joe, Holy Grail, International Joes, Leaky Suit Brigade | Permalink. Why people hide rarities like this is beyond me so am glad you posted pictures of it. Yeah, it is really strange that people get this stuff and it basically goes into a vault or personal collection and no one will know anything about this until the person dies or decides to sell. You have a pic? I’d be interested to see it. 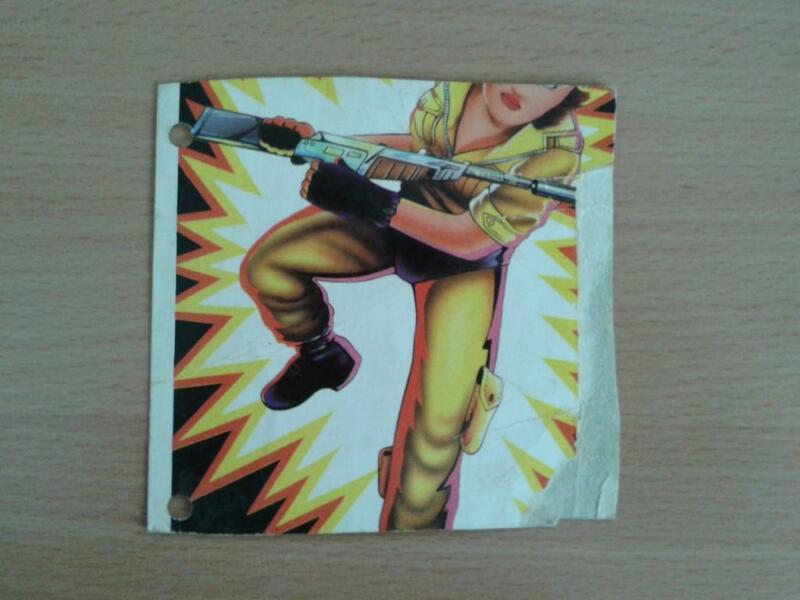 Is it part of the Commando Force or was it a Funskool GI Joe figure? A true collector doesn’t brag about what they have or what they found. They collect for their own personal happiness. If u have ever owned a highly sought after collectible you know what I’m talking about. The other reason is people bother you daily to sell them the item and it gets to be an issue. If they reach your breaking point then you get low balled with offers. I know the person that bought this figure and I’m sure he would agree with me on my thoughts. I myself show some pictures of my collection but I have nothing on display. I buy it and it’s packed away in a tote. Just knowing I own the item is satisfaction enough for me. Sharing something with the hobby is far from bragging. I have several highly sought after and very valuable pieces so I “know what you are talking about.” I hope you are insinuating that I am not a true collector because I think that people should be able to see cool items like this. It has NOTHING to do with bragging. And as far as people bothering you… I don’t let it bother me. I get offers all the time. Just ignore them. I collect and do this blog for my own personal happiness, not for anyone out there. I think you would get more enjoyment out of your hobby if you displayed it. I’m not insinuating anything. I’m in no position to judge anyone. Most people laugh at my collecting habits. I have spent over $5,000 on a single gijoe item and I have only looked at it once. When I opened the mail. Then to the tote it goes. I once spent $1,500 on a pair of tennis shoes and i never wore or took them out of the box. They also sit in a tote. Just stating in my opinion why I think people don’t show what they have or found. Trust me I love seeing this stuff myself and love blogs like this. Ok cool. I understand where you are coming from. I knew there might be a difference of opinion in posting the picture, but I thought it was really cool and wanted people to see it. I’d love to hear about your Joe stuff and those shoes, haha. I certainly agree with Jack, when dealing with the high end rarities, you need to be fairly closed off, people will always be trying to buy your things, to only wind up offering a third what it’s worth, etc. I know the guy who bought the Ven 6 set that was for sale, and can you imagine all the people hassling him if he ever publicly showed them? I disagree. Based on my experience, I own many of rarest and high priced Joes out there and I make it known through this blog. Maybe I am able to ignore and not let people’s interest bother me, which it seems like most cannot do. I’m usually flattered that people want my stuff and like to know that there are people out there who want to buy. I don’t see why you can’t ignore the question in the first place. And yes, I can imagine the 5, max 20 guys out there who have the interest and cash for the Ven 6. I offered $7K when that went up for sale just for the White Mortal and got turned down. Not a big deal…. I don’t get all the concern over hassling. Maybe it was bigger a couple years ago. Last thing, the only way they get the opportunity to low ball you and bother you is if you let them by entertaining an offer in the first place. Ignore the message and they usually never follow up. I will always show my stuff, especially if it is something that people would not see otherwise. I think we all made some good points and can share different opinions and still hold bearing. For example… Moc argen7 rumors continue to swirl about these existing but there are never any pictures publically shown to back them up. The truth is they all exist and very few lucky collectors (like myself) have had the opportunity to see these. Due to respect of the owners request pictures are never shown. This was mainly my point in my comment. I personally have seen all argen7 moc except manleh. Trust me I would love to show the pictures so everyone may be at peace with the subject. But do to the collectors request they don’t want them shown. So we are left in the dark until the owners publicly want to be known. Yeah, we have all made good points and it has made for an interesting discussion. I have also seen several A7 moc, all but a Mortal. Always assumed one or more were out there. Are there pictures anywhere online of the rest of those figures? Especially curious about Striker and the Scrap Iron-possessed Cross Country. There is quite a few pictures. The best thing to do is look up Canary Ann and check Hisstank. A single guy owns almost the whole set. 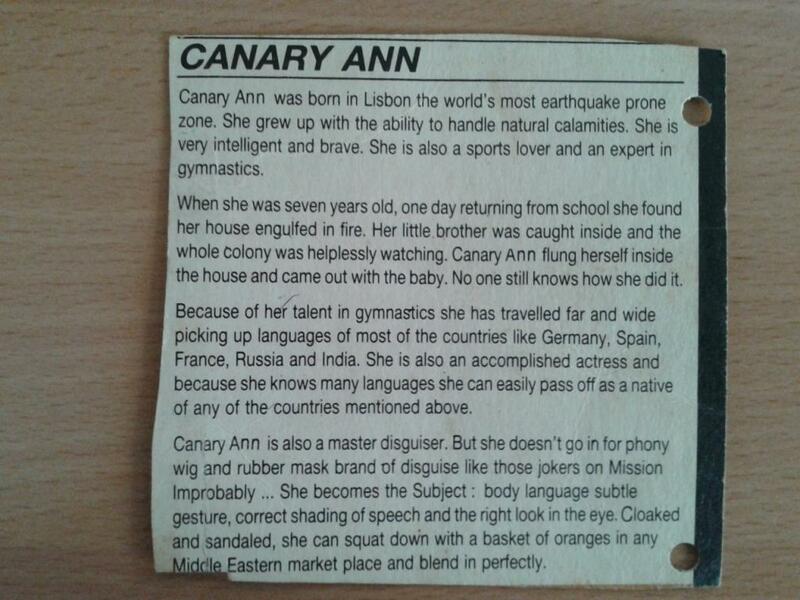 Actually, there is not any other pictures of Canary Ann. The only other picture is a picture of Canary Ann’s file card. I’ve seen the pictures on HT of the other figures, the guy the owns them lives 30 minutes away from me. Also, I am one of the guys that owns the full set except for Canary Ann. I can think of 3-4 guys that have them all or at least 3 – except for Canary Ann. I still believe there is only one in collectors hands. If you have different pictures of Canary Ann, please post them. But, I doubt there is another picture than the one I posted. The canary Ann picture on HT is from my blog. I own a Canary Ann in pretty good condition. I have had it in buried my collection for, let’s say, an insane length of time. Would part with it for a good price. Hey I have it,didn’t know it was this rare 🙂 i u guys need a pic mail me !